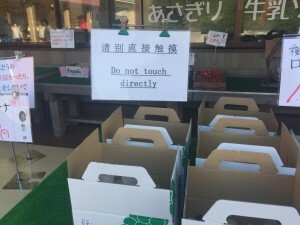 名古屋市昭和区の英会話スクールBigBowEnglishLab > ブログ > It’s “no horsefly” to touch the fruit! Last month I visited Lake Kawaguchi near Mt. Fuji with my husband. It's a popular touristy area, with many shops and boat tours. I've been there a few times in the past. This time I was really surprised because there were so many foreign tourists: tourists from English-speaking countries carrying huge backpacks, tourists from Southeast Asian countries wearing headscarves, and the ubiquitous large groups of cheerful Chinese tourists. For once in my life in Japan, I was part of the majority! There were signs in English and other languages everywhere and the workers in the shops or at the boat ports spoke to me in broken English. It was especially funny because they also spoke broken English to my Japanese husband, assuming he must be from another country since he was with me. Japan is currently going through a tourism boom and sightseeing areas are trying to do what they can to cope, especially with signs in English. The Internet is rife with examples of Japanese to English translation gone wrong, one notorious example being a sign that translated abunai, or dangerous, into "NO HORSEFLY." The machine translation software they must have used apparently divided the word into two: abu (horsefly) and nai (no). 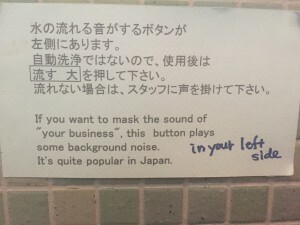 These mistakes concern me because it causes unnecessary misunderstandings, with the tourists not understanding what a sign is supposed to be communicating and the Japanese workers wondering why the tourists aren't following the rules on their English sign. For example, this sign, which I suppose was put up by the exasperated workers at a fruit stand, tired of tourists touching the grapes. You can tell this was directly translated from Japanese and one could joke that touching the fruit indirectly would be perfectly acceptable. Perhaps a clearer translation would have been simply, "Please don't touch the fruit." However, this sign in the restroom at the popular winery, Haramo, in Katsunuma was very cute. 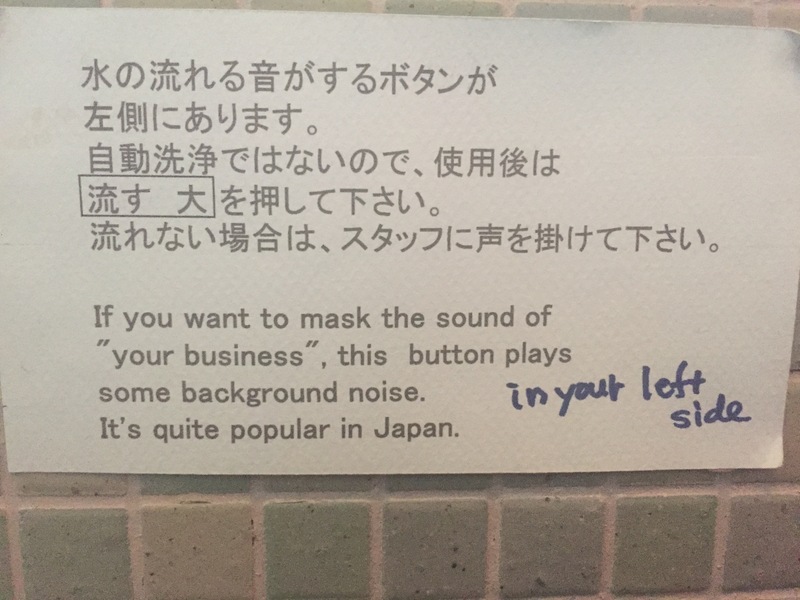 It tried to explain a common feature in Japanese toilets, where you push a button to hear the sound of water flowing to cover the sound one makes when the toilet is used!